It's important that our partners ALWAYS keep the competitive advantage. As a partner in our clients success it is important for us to closely guard intellectual property and strategy specifics. If you require specific information please contact us. Thank you... and please read on. It takes a lot of guts to strip your brand down to the bare essentials, but that's exactly what Vision Alignment did. Patty Azar, Chief Strategic Officer is a 25 year veteran in the field of strategic consulting. Partnering with companies like LifeLock, FedEx, and American Express Patty is no stranger to helping companies realize their true potential. It was no different when Patty saw the opportunity to take her company to the next level. VA realized that there was more than just a design standing in the way of gaining market leadership and increased sales. Initially Patty reached out to 23 Degrees to refresh her current Web site. After a review of the site and understanding of the desired goals, it became evident that the issue didn't lie solely in the design but at the heart of the brand. 23 Degrees created a customized strategy based on the areas we knew needed attention. Working with Vision Alignment we were able to extrapolate the true essence of the Vision Alignment brand and articulate it in a way that didn't alienate the audience. Then utilizing the parts of the brand we knew worked well we created an online presence that made light of the VA offering and supported its simplicity. 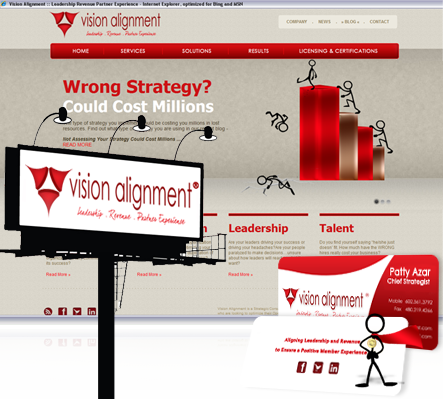 Vision Alignment is a strategic consulting company with expertise in Strategy, Organizational Development, Leadership and Talent Retention. Its mission: Aligning Leadership and Revenue to Ensure a Positive Member Experience. Vision Alignment, Inc. is located in Scottsdale, AZ. No one could have guessed just how bad the market would crash in '08, but as opportunities quickly started to dry up Michael Coontz, Owner/Founder of Arizona Quality Remodeling knew that if he didn't do something quick, he was going to have a tough time making it through. AQR needed not only an edge but a way to make it easy for potential customers to say "yes". Michael knew that in order to stay competitive he needed to be more visible and provide a more professional image for AQR. 23 Degrees got to work understanding what the true value was behind the brand. Through the process we found that the #1 comment from customers was the excellence in service delivery and Michael's straight forward honest approach. Taking from these cues, we created a brand message that spoke directly to these strengths and illustrated it with an "All American" vintage feel mixed with class, simplicity. Arizona Quality Remodeling designs and builds to meet lifestyle and budget. 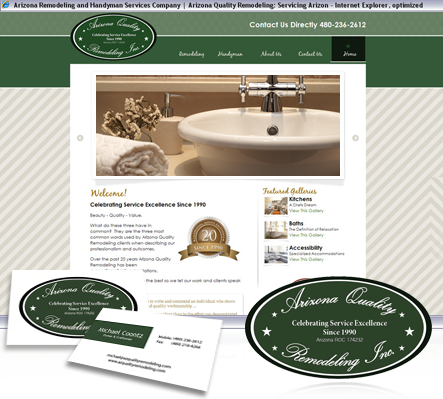 We offer a range of services from Refresh - Renew - Remodel. Our licensed team provides professional remodeling expertise from simple to luxurious.